McKesson Universal Walker Wheels from HealthyKin.com convert a folding walker into a wheeled walker. They fit most manufacturers' walkers. 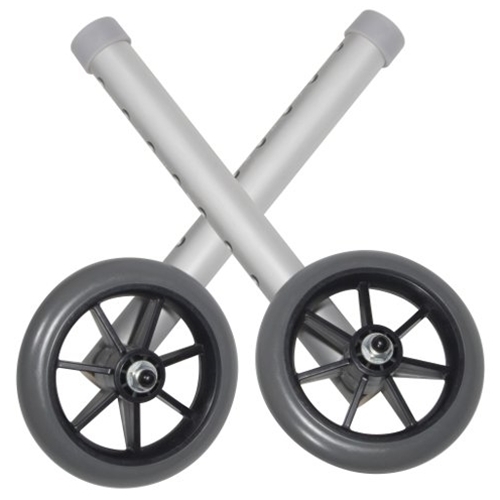 The rubber wheels allow the walker to roll easily and smoothly over irregular surfaces. They include rear glide caps and glide covers allowing use on nearly all surfaces. Fit perfectly and roll freely! called universal,but did not fit my walker. it cost me more to return them than they cost,should have just thrown them away. These wheels worked out very good on my Mothers walker. I think they are better than the originals. easy to install,works as it should,and I'm happy with it. Perfect. Took about 5 minutes to install and roll versus scratch my floors! Replaced original wheela on my walker. So much nicer than the worn ones.